Today is an exciting day - we have FOUR HUGE SURPRISES for you! 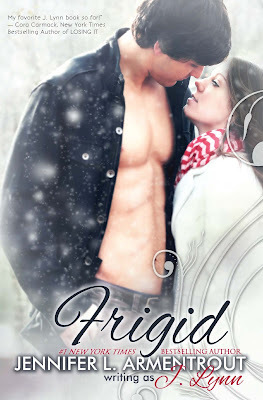 Jennifer L. Armentrout's (writing as J. Lynn) FRIGID is set to release on e-book at the end of July. If you're anything like us, you're probably on pins and needles and just cannot wait to get your hands on a copy of this book. FRIGID has already been given the honor of being named a Romantic Times Top Pick and we're super excited for you to be able to read it as well! Well, there's good news! Are you ready for those four awesome surprises? Here we go! 1. Due to all the excitement surrounding FRIGID, we have decided to run a special e-book pre-order promotion. We have worked out a deal with the distributor to release FRIGID a full two weeks early -- on JULY 15th!!! -- if we meet our e-book pre-order goal. EEEEP! That's right, if you are like the rest of us and want to be able to read FRIGID in its entirety before its original release date, all you have to do is PRE-ORDER THE E-BOOK NOW! What are you waiting for? GO! Pre-order it! 2. Need something to hold you over until FRIGID releases? Well, starting right now, you can read the first three chapters of FRIGID for free! Just read below! 3. Can’t get enough of the hot FRIGID cover? Want to see some behind the scenes photos that are sure to make you swoon? You’re in luck! Below you can watch a slideshow of all the behind the scenes photos from the photo shoot! Go on and watch it. We’ll wait, because there is still one more great surprise! 4. And last but not least, if you live near Philadelphia, PA, you're in for a very special treat -- Jennifer will be in Philly in November signing not only FRIGID but also the last book in her immensely popular COVENANT series, SENTINEL! But that's not all, Adam, the super hot cover model from FRIGID will be there as well! So, yes, you'll get to meet Jennifer and Adam! Plus, there will be other great prizes that you seriously won't want to miss out on (dinner with the author and model, perhaps?)! Stay tuned for more details to come! We hope you're as excited as we are! So now....Go pre-order FRIGID! Go read those chapters! Go watch that slideshow! And Enjoy! Oh my gosh, I'm preordering RIGHT NOW!!!! so good to know this! great review and great video sharing! thanks!